The small (4.8 kb) ssDNA AAV genome consists of two open reading frames, Rep and Cap, flanked by two 145 base inverted terminal repeats (ITRs). These ITRs base pair to allow for synthesis of the complementary DNA strand. Rep and Cap are translated to produce multiple distinct proteins (Rep78, Rep68, Rep52, Rep40 - required for the AAV life cycle; VP1, VP2, VP3 - capsid proteins). When constructing an AAV transfer plasmid, the transgene is placed between the two ITRs, and Rep and Cap are supplied in trans. In addition to Rep and Cap, AAV requires a helper plasmid containing genes from adenovirus. These genes (E4, E2a and VA) mediate AAV replication. 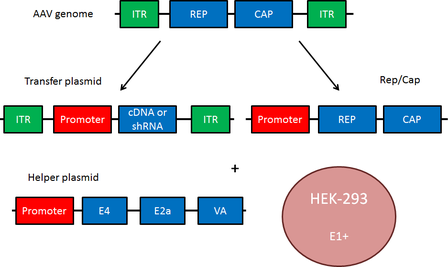 The transfer plasmid, Rep/Cap, and the helper plasmid are transfected into HEK293 cells, which contain the adenovirus gene E1+, to produce infectious AAV particles. Rep/Cap and the adenovirus helper genes may also be combined into a single plasmid; the separation of Rep and Cap shown in the figure on the right facilitates the viral pseudotyping discussed below. AAV is commonly used in optogenetics experiments. These viruses are preferred over lentiviruses because they remain primarily episomal, while lentiviruses integrate into the genome. This is important because local chromatin structure at the site of genome integration can affect the expression of transgenes, as well as the expression of neighboring genes. The short coding sequences of channelrhodopsins, halorhodopsins, and other optogenetic genes enables them to be packaged in AAVs. Click here for more information on optogenetics plasmids available from Addgene. The popular CRISPR/Cas9 genome editing system has been modified for use with AAV; this system represents a major step forward for in vivo genome editing. For more information on AAV-CRISPR, please see this blog post. Browse the article from Ran et al , 2015 from the Zhang Lab to find plasmids optimized for use in AAV, or containing Staphylococcus aureus (SaCas9) . AAV is also a promising method for gene therapy. Of the commonly used viruses, AAV produces the lowest immune response, is non-pathogenic even in the wild-type state, and is thus thought to be the most suitable virus for therapeutic applications. Clinical trials using AAV for various gene delivery applications are currently underway. As part of its lysogenic cycle, wild-type AAV integrates into the host genome at a specific site, AAVS1 on human chromosome 19. This site is favored due to the presence of a Rep binding element; however, random integrations may occur at a much lower frequency. As a replication-incompetent virus, AAV cannot enter the lytic cycle without help. Another virus, such as adenovirus or herpes simplex virus, or a genotoxic agent such as UV radiation or hydroxyurea, is necessary for lytic cycle activation. When recombinant AAV (rAAV) is used for research purposes, the Rep protein is supplied in trans , eliminating the ability of rAAV to integrate into its preferred site of genomic integration on human chromosome 19, termed AAVS1. Instead, the rAAV genome is typically processed into a double-stranded circular episome through double stranded synthesis. These episomes can concatemerize, producing high molecular weight structures that are maintained extrachromosomally. rAAV are more likely than wild-type AAV to integrate at non-homologous sites in the genome, and do so at about a 0.1% frequency. Nonetheless, the majority of rAAV particles are thought to be maintained in episomes or concatemers. Episomes differ profoundly from viral particles produced during a lytic cycle. rAAV episomes can develop chromatin-like organization and persist in non-dividing cells for a period of years without damaging the host cell. In contrast, viral particles produced during a lytic cycle are quickly released through cell lysis. Episomal stability enables long-term transgene expression in non-dividing cells and is a key advantage of rAAV. Eleven serotypes of AAV have thus far been identified, with the best characterized and most commonly used being AAV2. These serotypes differ in their tropism, or the types of cells they infect, making AAV a very useful system for preferentially transducing specific cell types. The chart below gives a summary of the tropism of AAV serotypes, indicating the optimal serotype(s) for transduction of a given organ. Researchers have further refined the tropism of AAV through pseudotyping, or the mixing of a capsid and genome from different viral serotypes. These serotypes are denoted using a slash, so that AAV2/5 indicates a virus containing the genome of serotype 2 packaged in the capsid from serotype 5. Use of these pseudotyped viruses can improve transduction efficiency, as well as alter tropism. For example, AAV2/5 targets neurons that are not efficiently transduced by AAV2/2, and is distributed more widely in the brain, indicating improved transduction efficiency. Many of these hybrid viruses have been well characterized and may be preferred over standard viruses for in vivo applications. Scientists have also experimented with hybrid capsids derived from multiple different serotypes, which also alter viral tropism. One common example is AAV-DJ, which contains a hybrid capsid derived from eight serotypes. AAV-DJ displays a higher transduction efficiency in vitro than any wild type serotype; in vivo , it displays very high infectivity across a broad range of cell types. The mutant AAV-DJ8 displays the properties of AAV-DJ, but with enhanced brain uptake. Self-complementary AAV (scAAV): One downside of AAV is its single-stranded DNA genome. Because the virus depends on the cell’s DNA replication machinery to synthesize the complementary strand, transgene expression may be delayed. To overcome this rate-limiting step, scAAV contains complementary sequences that are capable of spontaneously annealing, upon infection, which eliminates the requirement for host cell DNA synthesis. Unfortunately, this technique further limits the packaging capacity of AAV to 2.4 kb. Methods to Increase Packaging Capacity: To increase the packaging capacity of AAV, a longer transgene may be split between two AAV transfer plasmids, the first with a 3’ splice donor and the second with a 5’ splice acceptor. When these viruses co-infect a cell they form concatemers, are spliced together, and the full-length transgene can then be expressed. This method allows for longer transgene expression, but expression is much less efficient than with a single AAV virus (∼5%). Another technique for increasing packaging capacity depends on homologous recombination. In this method, a gene is divided between two transfer plasmids, but with substantial sequence overlap. Co-expression induces homologous recombination and expression of the full-length transgene at very low efficiency (<1% of wild type). If either of these methods can be made more efficient, the use of AAV viruses would no longer be limited to small transgenes, enabling the development of further AAV applications. Designer gene delivery vectors: molecular engineering and evolution of adeno-associated viral vectors for enhanced gene transfer. Kwon I, Schaffer DV. Pharm Res. 2008 Mar;25(3):489-99. PubMed. Adeno-associated virus serotypes: vector toolkit for human gene therapy. Wu Z, Asokan A, Samulski RJ. Mol. Ther. 2006 Sep;14(3):316-27. Epub 2006 Jul 7. PubMed. Recombinant AAV viral vectors pseudotyped with viral capsids from serotypes 1, 2, and 5 display differential efficiency and cell tropism after delivery to different regions of the central nervous system. Burger C, Gorbatyuk OS, Velardo MJ, Peden CS, Williams P, Zolotukhin S, Reier PJ, Mandel RJ, Muzyczka N. Mol. Ther. 2004 Aug;10(2):302-17. PubMed. From virus evolution to vector revolution: use of naturally occurring serotypes of adeno-associated virus (AAV) as novel vectors for human gene therapy. Grimm D, Kay MA. Curr Gene Ther. 2003 Aug;3(4):281-304. PubMed. Adeno-associated virus vector integration. Deyle DR, Russell DW. Curr Opin Mol Ther. 2009 Aug;11(4):442-447. PubMed. Self-complementary recombinant adeno-associated virus (scAAV) vectors promote efficient transduction independently of DNA synthesis. McCarty DM, Monahan PE, Samulski RJ. Gene Ther. 2001 Aug;8(16):1248-54. PubMed. Expanding AAV packaging capacity with trans-splicing or overlapping vectors: a quantitative comparison. Duan D, Yue Y, Engelhardt JF. Mol Ther. 2001 Oct;4(4):383-91. PubMed.